Last week, I was composing a rubric to go along with a writing assignment for my juniors. The assignment, though cleverly disguised as an end-of-unit essay for One Flew Over the Cuckoo's Nest, is actually a mock paper for the IB Language and Literature curriculum. For this assignment, students select one of six prescribed (by IB, not by me) questions to answer in the context of a text they've read. They then develop an 800-to-1000-word response that is grounded in the text. An important demand of this assignment is using evidence from the text to support students' own assertions. Not only must they find relevant quotations that support their argument (rather than simply summarizing the story), but they must do so while maintaining a formal tone and smooth style. I have found that students struggle with this skill year after year, despite repeated instruction and practice. The more I thought about the tutorial, the more I realized that some students would want to watch it more than once to solidify their understanding of the concept. I also loved that the related videos on YouTube could help students with this skill -- and I could help them find the tutorial easily if I just embedded the link on the rubric itself. Because we are not a 1:1 or BYOD school (yet), I knew that some of my students would be following the rubric from the hard copy and not the e-copy that they can find on my blog. That led me to goo.gl, where I created a shortened URL that isn't ridiculously annoying to copy into a browser. 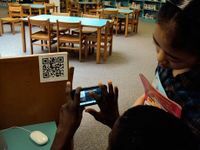 As I pasted the short link, I realized that I could quickly grab the automatically generated QR code from goo.gl and drop that into the rubric as well. Thus, my first interactive rubric was born! My very first interactive rubric! I included the QR code and the URL to ensure that students could access the tutorial regardless of whether or not they own a smartphone. The whole thing sounds so ridiculously simple -- give students easy access to a resource that will help with a challenging skill. Not so groundbreaking, right? But sometimes it's the little things that can make a big difference with our students, and I hope this is one of those times. While reviewing the assignment sheet in class, I pointed out the QR code to my students. I asked if someone would volunteer to scan it, and was delighted when a couple of students told me they already had. I believe that this bodes well. 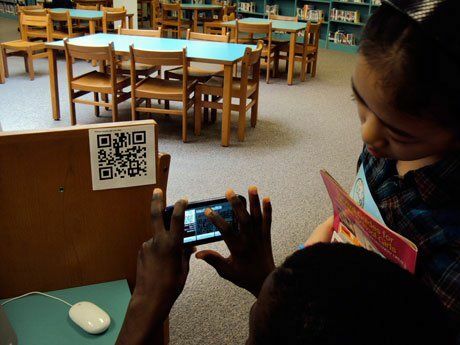 If they are already using the QR codes without prompting or instructions, we're off to a good start. Additionally, I have started reading through the papers, and so far quotation integration has been a strength rather than a struggle. This is not usually the case! I am optimistic that interactive rubrics will soon become part of my normal routine, especially since the whole process took but a few minutes of my time. Instead of linking to a tutorial, link to an online practice quiz on the concept you're assessing. This will allow students to review the concept and reinforce their understanding before submitting the assignment for which the rubric is designed. Link to an online survey that allows students to submit questions about the assignment. This could encourage them to work ahead and ask questions that they might be too nervous to ask in class. Link to a TodaysMeet room or other discussion forum that will allow students to collaboratively review concepts or ideas. Link to a Google Doc with class discussion notes (I maintain a class doc for every novel we read, but often students forget to review it before an assessment). Link to review games for whatever topic the section of the rubric assesses. For instance, if I were looking specifically for correct subject-verb agreement in this particular assignment, I could provide a link to this review game. If the assessment is more factual in nature, link part of the rubric to the PPT or whatever vehicle was used to present the information to students at the beginning of the unit. I hope this strategy will end up being one more tool in your never-ending bag of teacher tricks. How else can we design interactive rubrics that engage students? Let's discuss our ideas in the comments section below.